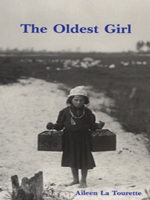 The Oldest Girl tells the story of one of the church's youngest saints from a modern perspective. Maria Goretti was born on October 16, 1890 in Corinaldo in Italy. Her mother Assunta was an orphan who had been left at the door of the local convent; her father Luigi was a poor peasant. The marriage was arranged by the local priest. The couple had two boys before Maria, their first daughterm the oldest girl was born. By the time she was six, Maria's family were forced to give up their farm, move, and work for other farmers. Maria's father, Luigi, became very sick with malaria, and died when Maria was just nine. While her brothers and mother worked in the fields, Maria would cook, sew, watch her infant sister, and keep the house clean. After Luigi died,the family had to move to Ferriere, near modern Nettuno and share a house with another family. It led to trouble. The father Giovanni Senenelli was a bitter man; his wife had gone mad; his son, Alessandro had gone to sea young and returned to help his father. The boy's reward was to be teased mercilessly for not being a real man. On July 5, 1902, Alessandro decided to prove he was a real man, He found Maria sewing alone and threatened to kill her if she did not let him make love to her. She fought him off. He stabbed her fourteen times. Maria was taken to the nearest hospital, was operated on without anaesthetics and died. Alessandro was too young to be executed and was sentenced to 30 years in jail. He showed no remorse. After the end of 1935-1945 war, the Pope, Pius XII (who has been accused of doing little to fight the Nazis), needed a glamorous and inspiring young saint. He wanted Italian girls to resist the American GIs who were swaggering through Italy. He pushed though the beatification and canonisation of Maria in record time.